“Count Almaviva (Nicholas Sharratt) and his unruly musicians come on like figures out of Gilbert and Sullivan, their gestures choreographed with comic precision, while Figaro (Grant Doyle) makes an entry reminiscent of the Major-General in the Pirates of Penzance. Sharratt produced an engaging vibrato (and perfect diction); when Rosina (Kitty Whately) came on song, her sound had a chaste beauty but somehow lacked fizz. Only when Andrew Slater’s larger-than-life Doctor Bartolo appeared – followed by Alan Fairs’s splendidly grotesque Don Basilio – did the pace hot up, but once it had, the evening never flagged for a moment. “English Touring Opera’s new production of Barber of Seville is traditional with a twist. 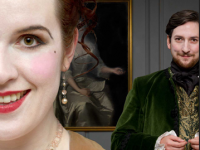 English Touring Opera’s spring season for 2012 is one of its strongest in recent years, consisting of two fine yet simple operatic roadshows. Alongside a revival of James Conway’s Eugene Onegin, memorable for its haunting symbolism, there’s a new and refreshingly straightforward Barber of Seville in which the director Thomas Guthrie aims for eye-catching clarity. Traditional with a twist – bearded “ladies” suggest that Figaro will never lack for customers – the Rossini is costumed in period. Yet for all the attractive airiness of Rhys Jarman’s mint-green sets, it is the panache of the performers that will doubtless win new audiences on this long national tour.